Summer is one of my favorite times of year to cook. Summer dinners can be super fresh and flavorful without a ton of work or prep time. When it's hot out, you don't want to spend a ton of time standing over a hot stove and you really don't have to-- some good seasoning and a little fresh produce is all you really need to create a really delicious summer dinner. After a long day of unpacking, curtain hanging, trips to Home Depot, and a weekend full of takeout I really wanted to eat something fresh and healthy for dinner that didn't take a ton of time to make. 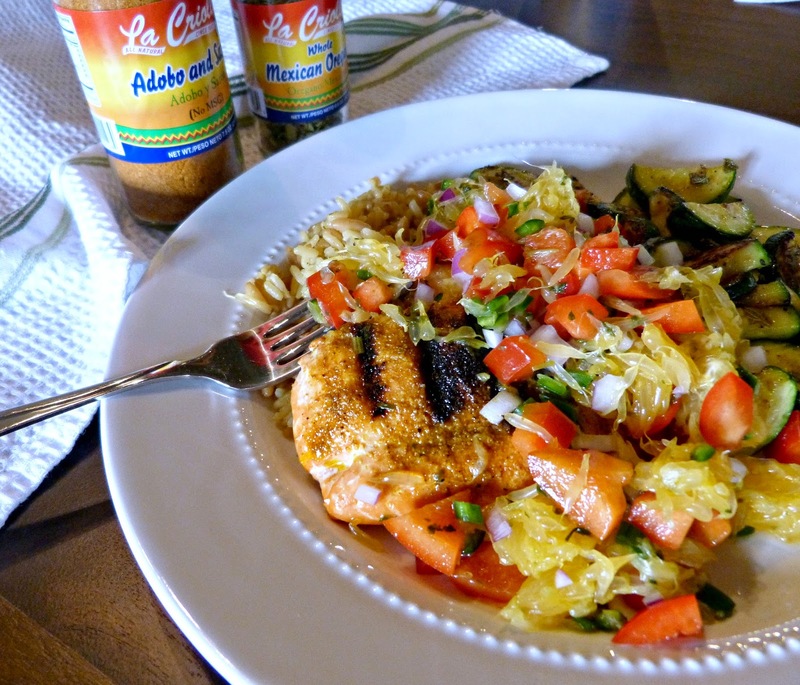 So I ran out to pick up some salmon and then pulled some La Criolla seasoning from my pantry and created the perfect summer Sunday dinner! 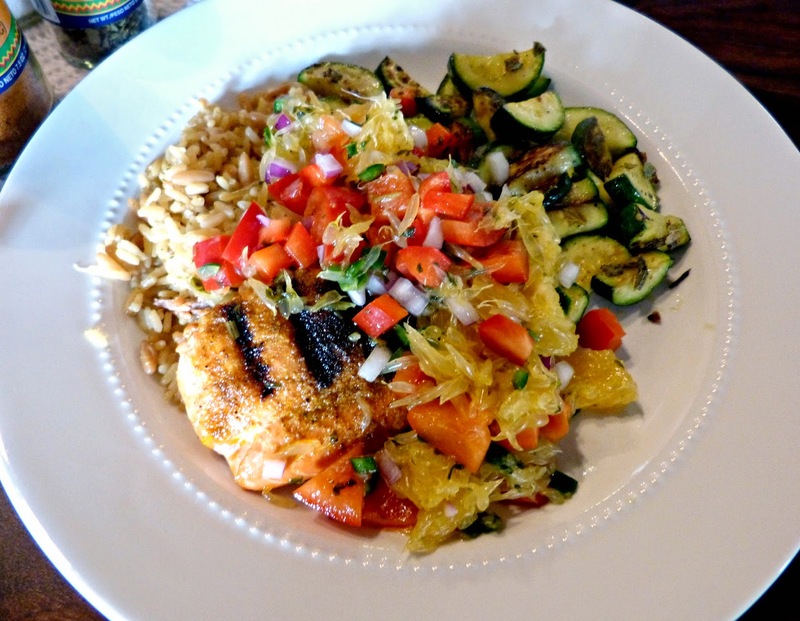 The salmon is simply seasoned with La Criolla Adobo & Sazon seasoning, pan seared, and served with a fresh, sweet, and slightly spicy homemade salsa of red bell pepper, oranges, red onion, and serrano. A little fresh lime juice and cilantro really brightens the whole thing up and the sweet tang is such a perfect complement to the salmon, which is rich on its own, but also gets a great savory spicy flavor from the Adobo & Sazon. Not familiar with Adobo & Sazon? Neither was I until the kind people over at La Criolla suggested that I try it. Adobo is a traditional Mexican seasoning blend typically composed of salt, paprika, black pepper, onion powder, oregano, cumin, garlic powder, and chili powder. Sazon is a seasoned salt blend (usually including cilantro, achiote and garlic). Both are common all-purpose seasonings in Latin American cooking, so when you blend the two, you can imagine how tasty and versatile that blend is-- I plan on sprinkling this on our burgers the next time we're grilling and topping with some charred peppers. Doesn't that sound great!? Not familiar with La Criolla? They're a locally owned and operated Chicago company specializing in quality spices with no preservatives, additives, dyes, or fillers along with other Hispanic specialty ingredients. Avelino Maldonado started his business selling spices out of his car in 1957 and quickly became popular with the Hispanic specialty grocers in the area. That year he also introduced his Adobo seasoning blend and it continues to be a best seller. Today, La Criolla is based in Chicago's West Loop neighborhood and their products can be found at both Hispanic specialty grocers and major grocery store chains alike. Check out their website to find out more about their products! Heat canola oil in a cast iron grill pan or skillet over medium high heat. Season the flesh side of the salmon fillet evenly with the Adobo & Sazon and place seasoned flesh side down on the hot pan. Cook for 4-5 minutes and use a spatula to gently pull the salmon up and flip it over. Drizzle with olive oil and place in the oven. Bake for an additional 10-15 minutes or until salmon reaches your desired degree of doneness. Meanwhile, combine the orange and next 6 ingredients (through salt and pepper) in a medium bowl. Cover and refrigerate until ready to serve. Cut the cooked salmon into two portions and plate. Top with the orange & pepper salsa and serve. Editor's Note: La Criolla products were provided to me at no cost to facilitate this post. The opinions expressed here, as always, are my own.